1/11/2013 - I purchased previously used front and rear Wilwood brakes. 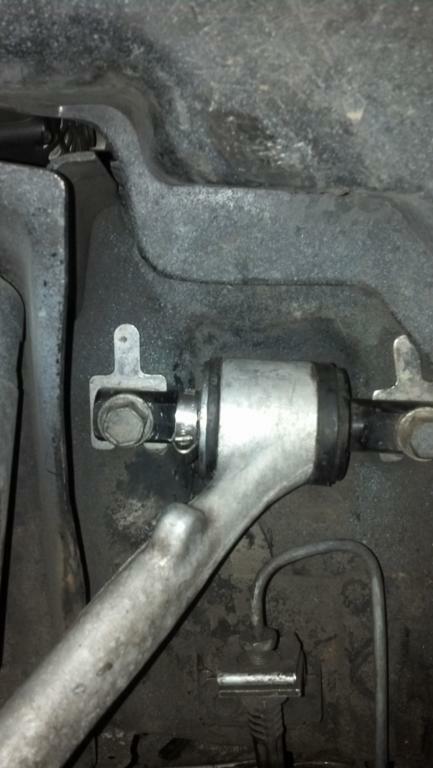 1st Class Alignment & Repair did the expert installation. Click here for pics and details. 1/27/2013 - Eric and Joey at 1st Class Alignment & Repair started swapping parts from the blue car to Snowflake. Pics here. 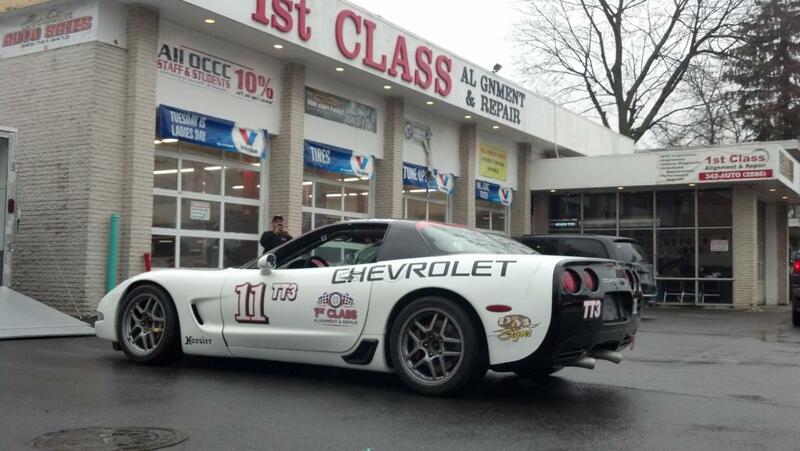 3/5/2013 - Jay and Bruno at Orange County Automotive do their magic with a new paint scheme for Snowflake. Pics here of the progress. 4/1/2013 - Phoenix Performance goes over the car for final settings and safety inspection. Install diff cooler, corner balance, alignment, center console switches. Pics here. 4/10/2013 - Julio at Cartek does his tuning magic. 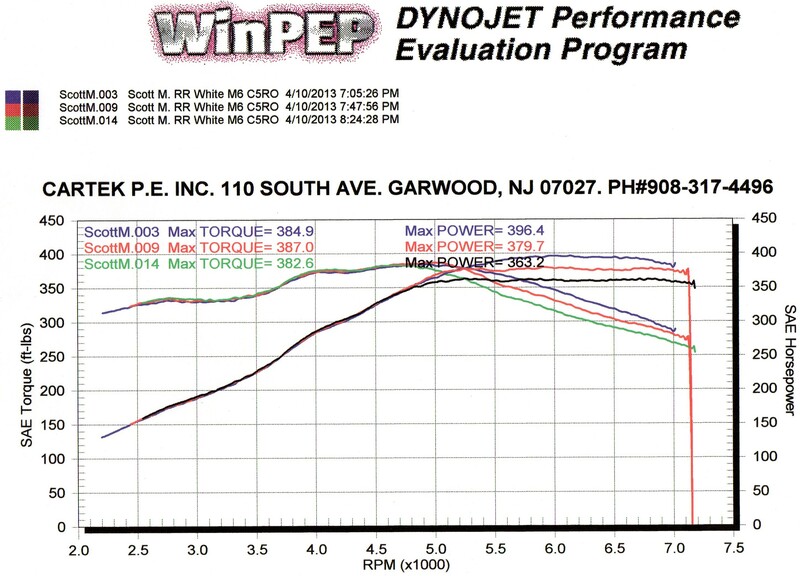 Dyno chart here. 4/13/2013 - Dave at D&M Signs applies custom graphics. Pics here. 5/4/2013 - Maintenance and prep for next event. Shimmed calipers (had rotor to caliper contact), steering rack boots contacting T1 sway bar, poly bushing snap ring popped off. Pics. 5/25/2013 - Prepped car for next event. Flipped the front pads, put heat tape around some wires near exhaust, oil and filter change (Mobil 1 5w/30), and tried to seat upper bushing on drivers side with a band clamp. Noticed C1255 error code; will have to keep eye on that. EBTM internal malfunction. 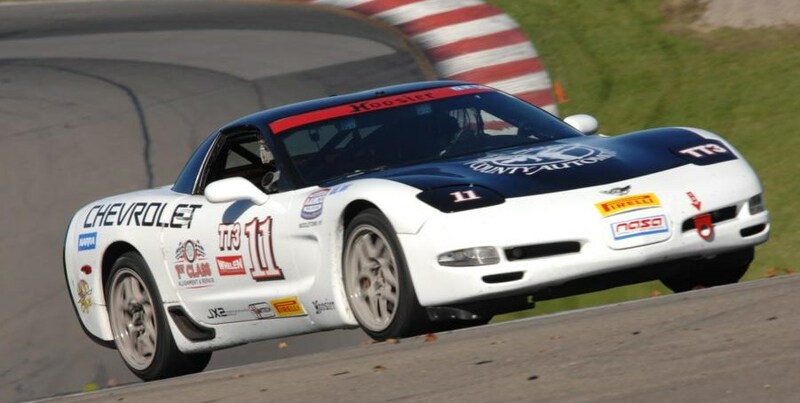 Did it on my last corvette. Researching EBCM and ABS issues here. 7/25/2013 - Prepping car for NJMP. Pics here. 8/3 - 8/4/2013 - NASA TT @ NJMP Lightning. 3rd place both days. Pics here. 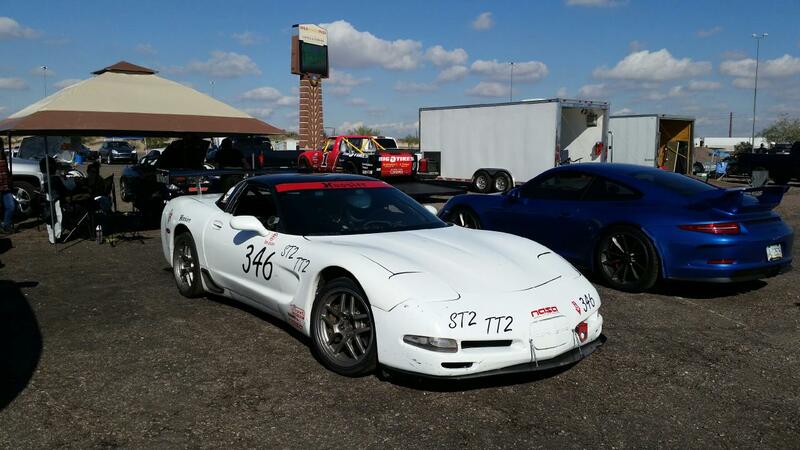 8/17 - 8/17/2013 - NARRA TT @ Pitt Race. 1st place on Saturday and 2nd place on Sunday. Pics and videos here. 9/28 - 9/29/2013 - NASA TT @ Watkins Glen. 1st place both days. Pics here. Also changed up the catch cans' petcock valves; click here. 10/26 -10/27/2013 - NASA TT @ NJMP Thunderbolt. 3rd place on Saturday and 2nd place on Sunday. Learned a lot but wasn't consistent enough to get top spot of podium. Pics and video here. 12/25/2013 - Bought used Penske 8300 shocks. Pics here. 4/10/2014 - Prepping car for the track. Checked alignment, changed valve springs, new fluids, some new body parts and paint. See pics here.